Whew! It’s been a busy week. There are exactly two days left to NaNoWriMo, the 2013 edition and my month of yearly crazy, creative hyper and constant speed writing. Actually, it’s not as crazy as it sounds, but I kind of like the little touch of crazy there, because it reminds me that NaNo is all about writing–and having fun while you do it. 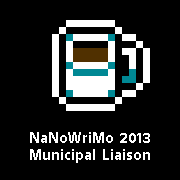 So, now that it’s almost NaNo, I mean, November, it’s time for my obligatory NaNoWriMo Post. I try to do these earlier in the month in hopes of dragging more innocent interested writers into the adventure with me, but as this is my graduating semester at University and as a 4th year ML(Municipal Liaison), I’ve been plugging NaNo around on campus, rather than my blog. But, I would never forget my loyal readers, so here’s the updated “Why I do NaNo” in complete excessive rambling style. The short version will follow shortly. NaNoWriMo stands for National Novel Writing Month where the goal is to write 50,000 words in 30 Days. Wouldja like to hear my campus pitch? I’ve been practicing it for nearly the entire month and somehow, (big surprise! ), it seems to sound better in written words than the spoken ones. 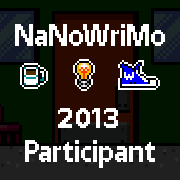 NaNoWriMo, shortened to NaNo, is an international, month-long, non-profit writing event for writers all around the world. The idea is to write a novel (or novel-length manuscript) of 50,000 words during the month of November in a mere 30 Days. As crazy as that sounds, it’s a tremendous amoung of fun with an amazingly supportive writing community of like-minded writers. It was founded in 1999 by Chris Baty out of Berkley CA. NaNo is now in its 15th year. Everywhere! Literally half a million writers will be joining in the NaNo madness this year in over 600 regions across 7 continents. It’s going to be amazing. To know where local events (such as writer meet-ups and weekly write-ins) are hosted, home in to your local region by finding your state and the closest city. If your city isn’t listed, try the “elsewhere” region–you’ll find online events and chatrooms where you can participate. As mentioned above, NaNo takes place in November. Too busy in November? A more relaxed, stripped down version of NaNo called Camp NaNoWriMo takes place in Spring and Summer with alternate months. For instance, this year, they ran Camp NaNo’s for April and July. The year before was June and August. You! and me! and any other writer interested in using NaNo as a kick in the pants to get some words down on a page. You do not have to write fiction to qualify to give NaNo a shot. It is free for everyone to join. To sweeten the deal, there’s a touch of the real writing world with the solid Nov 30th deadline, prompts to keep up with your project through a daily word count goal and encouraging pep talks from famous authors like James Patterson and Lemony Snicket. (writers under 13 can participate in the YWP). Web badges. A certificate. Up to 50% off amazing writing software for both Mac and PC, such as Scrivener and Storyist, as well as discounts on editing packages. You will also receive up to 2 free proof copies of your book through Amazon’s POD, CreateSpace. And of course, you’ll have a rough draft or a Zero draft, if it’s rougher than rough, to help jumpstart your writing project. The hardest part of novel writing can be starting or continuing, NaNo helps you to build forward momentum and get the story out. Because it’s quite difficult to edit/publish something you haven’t written yet, eh? Because it’s fun. No, I’m not kidding. Writing should be fun, something enjoyable and refreshing. Sometimes it’s easy to get lost in all the technical points or the difficulties of writing a specific draft or required proposal that you forget why you started writing in the first place. Every year, I look forward to NaNo because it’s pure stress relief. I can do what I do best–unleash my creativity on a blank novel-shaped canvas–and I can have fun doing it. There is no pressure to share, edit or craft perfect sentences, I just write what I’d want to read–a really fantastic story. Through NaNo, I have produced several decent drafts of novels in the process of being edited, reworked and someday, will be published. I owe this to NaNo. I would recommend that every writer give it an honest shot, at least once. If you hate it, fine, but at least you would have tried it. This is actually my favorite section in my presentation. How do you do NaNo? Honestly, one word at a time. No, I’m not being smart, I’m being serious. I sit down and I write one word after the other and I keep on doing this until the end of November and sometimes into December or January, so I can finish the story. November is a ridiculously busy time for me, but I have a fantastic time thinking and puzzling through the finer points of writing my story, getting to know the characters and bringing it all together. 50k words works out to be 1667 words a day or 1700, if you want to round up. Most of us write about 1000 words a day on a daily basis, through emails, texts and random things like notes to family and grocery lists. 1667 isn’t that hard. Ah yes, the rules. It’s simple. Don’t write anything before November 1st. Nothing. Nada. Zip. You can outline and plot and character sketch and world build to your heart’s content, just don’t actually start writing until November 1st. You’re welcome to keep writing after Nov 30th. 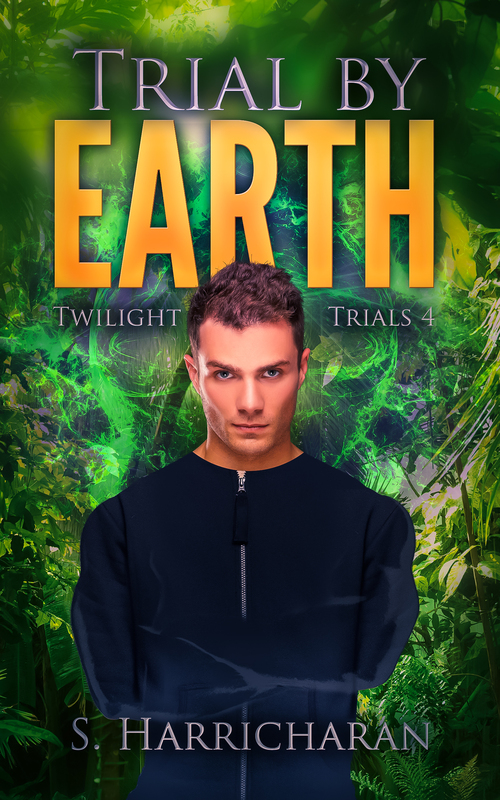 If that sounds a little crazy, let me mention something interesting–writers like Sara Gruen(Water for Elephants) and Erin Morgenstern(The Night Circus)–wrote their first drafts during NaNo. Then they polished them up and sent them out. Pretty inspiring, huh? This year’s theme is 8-bit, just in case you were wondering about the pixelated web badges, the theme changes every year. Last year was Venn Diagrams(very cool!) and they are free for your blog, website, Facebook, Twitter and everything, so you can find fellow wrimos and declare your noveling passion. Go ahead and give NaNo a shot, because it’s pretty hard to edit something that you’ve never written. If you’d like to novel along with me, find me here as ScarletFury. Feel free to add me as a buddy or drop me a nanomail. I love hearing from fellow Wrimos.